Repeat loan clients are not unusual at UCEDC – we’re proud to say that many small business owners have looked to us to help support their growth over time with more than one loan. But few, if any, can match our relationship with Renna Media and its owners, Joe and Tina Renna. The Renna’s were first introduced to UCEDC lending back in 1990 when we were a one-county agency. At that time we provided the mortgage for a commercial building in Rahway for their marketing and advertising company. Two small microloans followed in 1996 and 1997, which the couple used to purchase computer equipment. 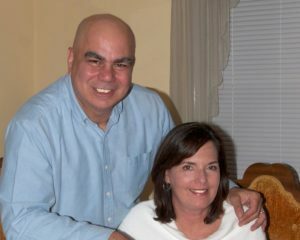 In 1998, Joe and Tina expanded into newspaper publishing with the creation of Around About Peterstown, a hyper-local community-based free newspaper serving Elizabeth. Shortly after, they added five more local papers in Kenilworth, Springfield, Linden, Rahway, Clark, and Union. Advertisers like what they saw: the Renna’s kept their rates bare bone , with no contracts required. And unlike other free publications, their newspapers are actually mailed to residents and businesses of the communities and not just left on a driveway. Things were going smoothly until Sandy hit in late 2012. With so many of their advertisers impacted by the storm, the Renna’s lost significant revenue and a planned expansion into Somerset county had to be delayed, leading to more losses. Thankfully, a 2% storm loan from UCEDC in 2013 helped provide the working capital they needed to compensate for the lost revenue and created two full time postions. The self-described “Mom and Pop Shop” operation continued to grow as it added more papers into an expanding territory. In 2015 Joe and Tina returned to UCEDC for a microloan to fund an additional six papers in Union County. By early 2018, Renna Media included 21 community newspapers in Union, Somerset, and Morris Counties along with printing and design services. Each publication delivers important information from the departments in town hall, schools, and libraries, and gives a venue to non-profit organizations to promote upcoming events as well as to showcase the accomplishments of local residents and businesses. With a robust website and social media presence, including a YouTube channel, Renna Media is keeping pace with new technology and consumer expectations. That’s why we were happy to approve their sixth loan with UCEDC in July 2018, which they earmarked for working capital and expansion of their internet presence.